Critical thinking is one of the most important soft skills you can possess. You need to apply your critical thinking skills in almost every area in life, be it in your exams or in your employment. Critical reasoning is the ability that helps you to make quick and accurate decisions. It is helpful not only when you have to make logical decisions, but also when ethical choices are posed before you. Examinations around the world are designed to test your critical thinking abilities through various puzzles and problems. This involves thinking rationally, making value judgments, and taking into account all information present at your disposal. Critical thinking is important in more areas than one. Here, let us find out how. When you can think critically, you take into account all the information you have in front of you. Since you do not think in a hurry, you are not likely to omit any information while pondering on them. And having all the information at your fingertips makes you more efficient at communicating effectively. A critical thinker will always collect sufficient data before they begin to speak, and their reasoning is more often than not completely sound. You will have ample evidence and data to support your theories, and you will be at a better position to convince your audience. A critical thinker always looks at an issue from all perspectives before they come to a decision. Going by gut feeling, following your instincts, and just guessing do not hold a very high position in their mindset. They will gather all the relevant data and go over them minutely, looking at each and every aspect of the problem carefully. They will not overlook any information. As a result, the critical thinker is almost always accurate in their decisions. This is, of course, invaluable in everyday life; whether you are solving problems in an examination, or taking an important decision in your workplace. Critical thinking requires you to look at a situation from all angles, hence, you can say goodbye to biased judgments. It will not be possible for you to come to a decision that is fair and unprejudiced and cannot be refuted unless you have looked at the problem from all angles. Practicing critical thinking makes you a lot more appreciative of differing worldviews. You come to appreciate the fact that there is no one size fits all rule for anything in life, and that people’s opinions differ on most aspects. It makes you less judgmental and more accepting of differences. 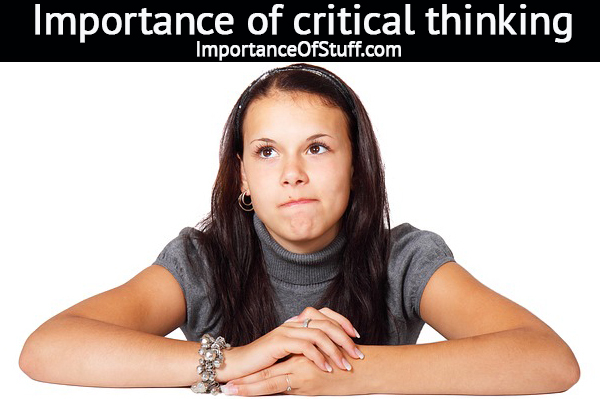 A critical thinker looks at all the information at their disposal before they come to a decision. On the surface, it may look as though this process will take up a lot of time, and to be fair, in the beginning it probably does. However, as you get better and better with critical thinking, you learn to recognize the critical information. When you become a pro, you can easily filter out the unnecessary information and move on to assess only the bits that are required to make an inference. Naturally, this takes a lot less time than mulling over a load of unnecessary data would have. As a critical thinker, you instinctively know that there is no one solution for every problem. And you also know that the best solution to a problem is not always what you have in front of you, or what has been employed countless times in the past. Since you think critically, you are aware of the minute details of the situation, and you strive to find out the solution that is the exact fit for the situation. And since the correct solution has not been given and probably does not exist, you are propelled to creating one. In the process, you come to learn of new approaches to a solution, which in turn hones your reasoning and problem solving skills even further. A person who can think critically is able to think fast, and change their thinking according to the situation I this fast changing knowledge based employment scenario, that is an invaluable skill. Today, the global knowledge based economy is being driven forward by technology and information, and it has become absolutely imperative that one is able to think fast and efficiently. Flexibility of intellectual skills comes hand in hand with the ability to apply expertise in critical thinking in a variety of scenarios, so that the employee is not stuck into a certain industry with a specific set of skills. The critical thinker is able to move effortlessly from education to fashion to real estate.